LONDON--(BUSINESS WIRE)--SpendEdge, a global procurement market intelligence firm, has announced the release of their Global Service Fulfillment Category - Procurement Market Intelligence Report. 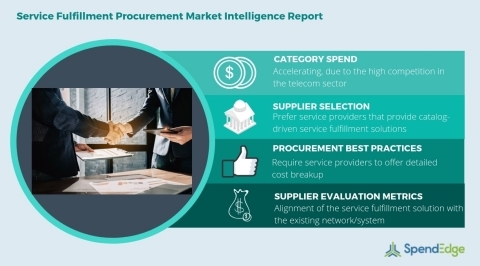 The fiercely competitive supply market of the telecom industry is compelling service providers to invest in the service fulfillment solutions that can minimize their time-to-market for new services and minimize their OPEX. The current market trends indicate favorable category growth during the forecast period. However, buyers will have to combat spiraling category prices which are the results of a highly saturated service fulfillment supply market. Such nature of the market gives the supplier the liberty to bring dynamism in the category pricing at their own will. Download the free sample of this service fulfillment market intelligence report here! The US will witness a high degree of category adoption to cater to the growing need for better wireless connectivity following the proliferation of internet-enabled devices and the availability of unlimited data plans for mobile users. Buyers from the telecom sector in North America and Europe are focusing on retaining their existing customers rather than acquiring newer subscribers. This is creating the need to improve its network connectivity which is expected to drive the demand for service fulfillment solutions in the regions. This service fulfillment procurement research report offers comprehensive coverage of the factors influencing the pricing strategies across various regions and helps buyers to identify opportunities for cost savings. To help buyers procure the at cost-effective rates, an analysis of the pricing strategies, insights into supplier selection criteria, and procurement best practices are also offered in this report. Not what you are looking for? Request for personalization of this service fulfillment procurement research report. “Buyers are advised to acquire a detailed cost structure break-up from the service providers which will allow them the visibility on the avenues to save costs,” says SpendEdge procurement expert Tridib Bora. SpendEdge’s procurement market intelligence reports for the logistics, warehousing and transportation category offer information on critical cost drivers and category pricing strategies to help the buyers achieve significant cost-savings. The supply market forecasts provide information on supplier performance benchmarking criteria to help buyers reduce spend and establish better SLAs. Additionally, SpendEdge’s reports offer category management insights and procurement best practices for the category.